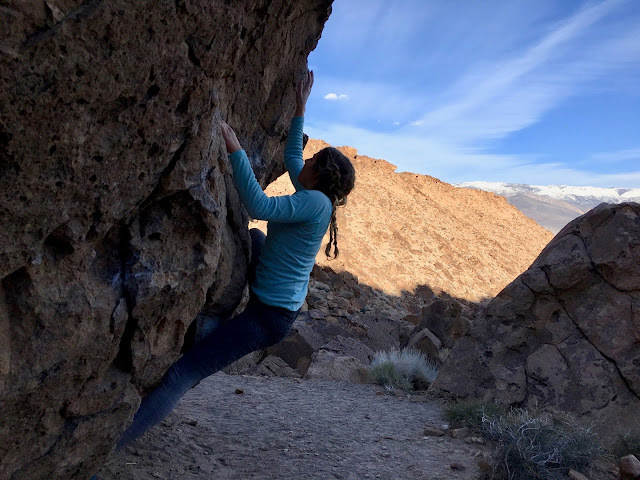 Jovanna and I drove up to Bishop early Saturday morning for a full day at the Happy Boulders. It had been a year since I'd last been to Bishop, and even longer since I climbed at the tablelands. I was excited to be back! We spent the morning meandering through the canyon floor and jumping on fun classics. It started heating up and getting more crowded so we headed up the canyon side so I could jump on He Got Game (V11). After figuring out the beta for the crux sequences exiting the roof, I managed to send! We continued climbing throughout the afternoon until our skin had us stop. It was great getting out to the Sierras and I can't wait to get back!